Every customer has their own unique needs. Customize the distillation system with the features that are right for you. High Efficiency: The key to a good fractional distillation system is a high efficiency distillation column. The more efficient the distillation column, the higher the purity of the distilled material. B/R builds high efficiency distillation columns in 15 theoretical plate sections (approximately 110 cm). Column sections can be stacked 2 or 3 high in order to give 15, 30 or 45 theoretical plates of separating power. You can choose the amount of separating power needed for your application. 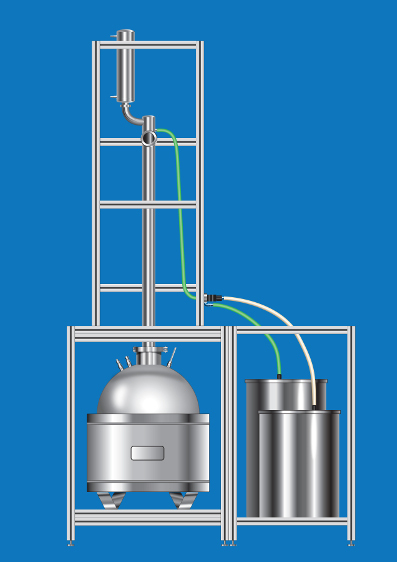 Steel Construction: Building a pilot scale distillation system from steel is an important safety feature due to the large volume of flammable material being distilled. Distillation systems can be made from thick carbon steel or stainless steel according to your needs. We can also electropolish the distillation system in order to passivate the contact surfaces. Customized for your Application: The pilot scale fractional distillation system can be configured according to your needs. Automation, vacuum systems, fraction collectors and other accessories can be integrated into the SPC distillation system as needed. The result is a distillation apparatus customized to your specific needs. Easy to use: The distillation process is fully automated from beginning to end, minimizing the time needed to operate the equipment. Easy programming of parameters makes you feel like a distillation expert. 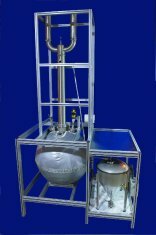 Heating, collecting of distillate and shut down of equipment at completion are all done automatically. Optional control from a PC.